A Respirator Mask: A respirators will help purify/filter the air you are breathing.The most common respirator is half face. When using these it is advised to use safety googles and the correct eyewear. 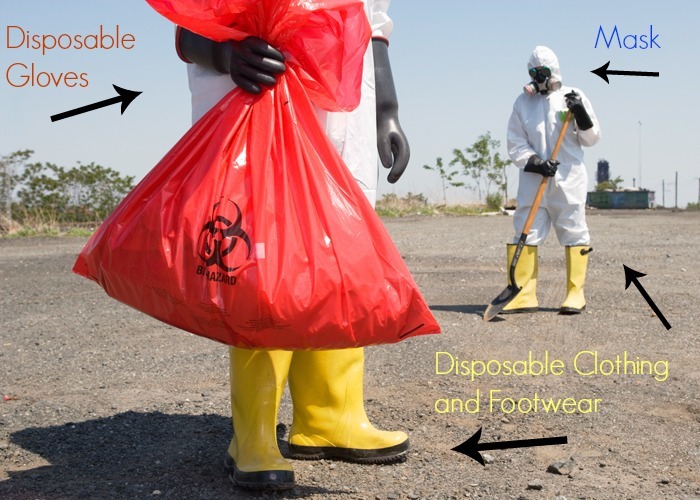 Disposable Coveralls: Disposable clothing or better correct terms, Disposable Coveralls is essential in protecting your body from any asbestos debris. These type of coveralls will allow you to not worry about having your clothes be exposed to any asbestos fibers. Once you are done working and handling asbestos, you can easily dispose the coveralls and dispose them in a designated waste bag. Rubber Boots: Just like in the article, not wearing rubber boots can make asbestos fibers get stuck in the laces. Boots will also help your feet be protected from any other debris found in the area you work in. Disposable gloves: Gloves will reduce the amount of asbestos on your hands. Just like the coveralls, the gloves can be disposed as well in the designated waste bag. At Alliance, we are always following safety procedures and will ensure the safety of others. In addition, if you need a company to remove asbestos contact your local office and will can be of assistance. Follow our Facebook Community Page and join the conversation via Twitterto learn more about the services we provide and the latest news on the industry.